Today we’re going to talk about two questions that look very similar but in fact are very different. The first question: Do you have the time? Do you know how you answer this question? Well, when somebody asks you if you have THE time, they want to know what time it is. So your answer could be “It’s three-thirty” or “quarter to five” or “I’m sorry I don’t know”. 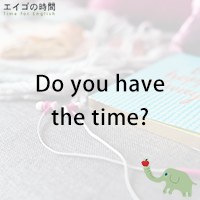 Now, the second question: Do you have time? Notice that there is no THE before the word “time”. When your friend asks you if you have time, she wants to talk to you about something. She wants to know if you are free. So your answer could be “Sure, what is it?” or “I’m sorry but I’m a bit busy right now”. You now know these two questions “Do you have the time?” and “Do you have time?” are very different and that you need to answer them differently. Now, why don’t you try a quiz? I’ll give you three sentences. Please listen carefully and choose the one that is NOT correct. Ready? 1. I’m sorry I don’t know. 2. I’m sorry I’m busy right now. Next Post 時間大丈夫？ – Are you OK for time?